This rock-solid program concentrates on imaging drives, and to good effect. Sometimes it's better to have a program that's just superb at just one task rather than one that does a lot of things in mediocre fashion. 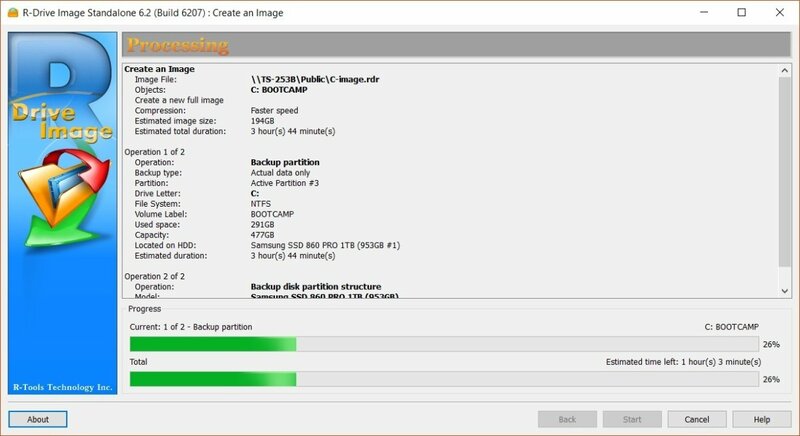 In this case, I'm talking about the $45 R-Drive Image, which does everything related to imaging of disks and the related tasks, but leaves file-base backup, syncing, etc. to the competition. The reward for the laser-like concentration on is the most reliable imaging I've ever come across, not to mention a very lightweight system footprint. 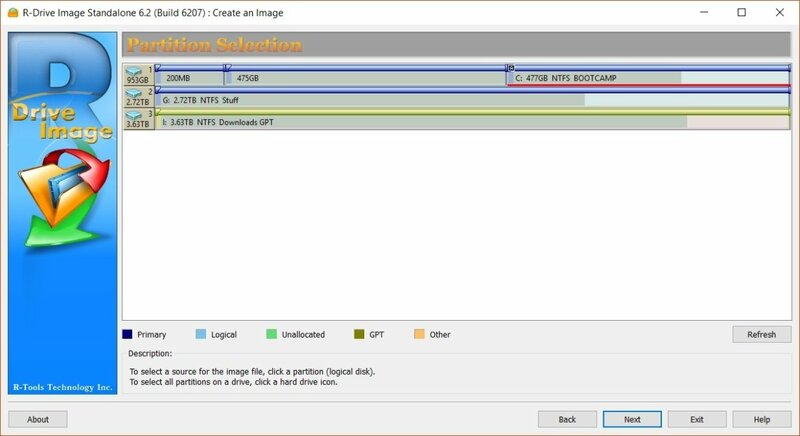 R-Drive image creates image files of disks and individual partitions, that is, it creates a bit-by-bit exact copies of the contents of your drive, including the layout and boot sectors, all written to one handy container file that's easy to store and archive. While file backup saves your important data, images are used to recover your crashed system to a point in time so you can get back to work more quickly. Not to mention, recovering all that optimization you did to get things just the way you like them. As R-Drive Image also supports Apple's HFS/HFS+ files systems, it can also be used to protect Macs, including those running Windows under Boot Camp. The Windows partition isn't protected by Time Machine. You'll need to do this from the boot media, but that can actually be fun in this case. Alas, the newer APFS isn't supported, but the company informed me that is in the works. Okay, I have a weird idea of fun, but accompanying the regular GUI version of the recovery app is a character-based one. 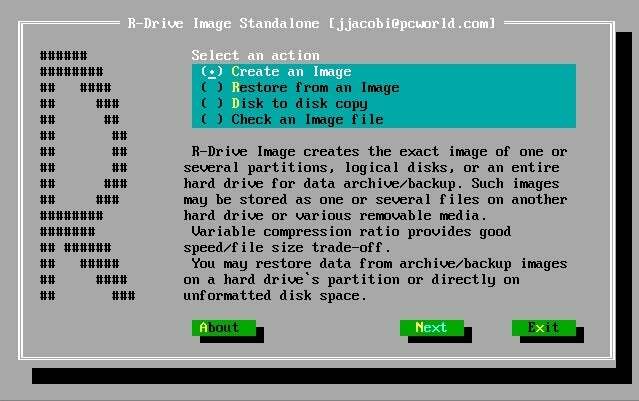 Boot from the USB/CD/floppy boot media (yes, floppies) that R-Drive Image will creates, and you can both intimidate and amaze your friends. Besides imaging of partitions and entire drives, R-Drive supports cloning, etc. The recovery disc interface looks exactly the same, though there's also a character-based one that you can see in the next image. The R-Drive Image interface isn't fancy, but it's pleasant enough to look at, and logically steps you through the tasks. If you want to have fun at your friend's expense, use this character-based interface from the boot disc to impress them. The default is a graphical interface that looks just like the Windows version. Where's the fun in that? There is one ability I personally miss and that's the ability to create .VHD files or .ISO. Why VHD or .ISO? Simply because they can be easily mounted on Windows, and in the case of ISO, any operating system, to recover files without the need for the proprietary software that created it. R-Drive of course supports backing up both drives and individual partitions. It will also clone disks and back up Macs running the older HFS/HFS+, including dual-boot Windows/macOS Macs. As I mentioned, R-Drive mounts its own images as virtual disks under Windows with their own drive letters, and does so very reliably. It's quick, easy, and as reliable as everything else in the the program is so reliable, so I've continued to use it despite that "shortcoming". 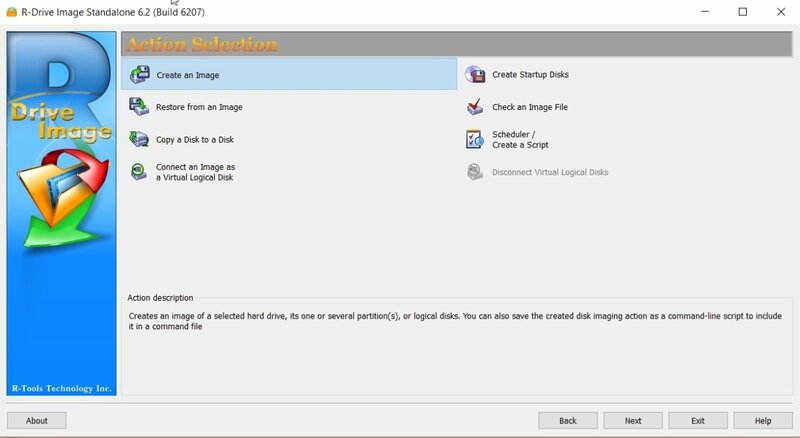 There is also a $299 version of R-Drive Image, Technician that allows use on a single server to back up as many computers as are on the network. This is a bit of a cheat as I've been using R-Drive Image for a very long time, but in all the time I've been using it, it's never let me down. In the tests I ran for this review, it backed up a 291GB partition in approximately 35 minutes, although the initial estimate was a rather pessimistic 3 hours and 44 minutes. Yes, like a certain engineer aboard a certain famous imaginary starship, R-Drive image regularly, initially reports a far lengthier time to accomplish a backup than it actually takes. Look under the progress bar and you'll find a far more accurate assessment that's updated throughout the process. R-Drive Image strutting it's stuff. Note the super long time initial estimate. The backup actually took about 35 minutes to a NAS box. The time remaining is updated and very accurate. The 35 minute backup was at normal priority using normal compression which didn't slow down the vintage-2011 computer I used in any meaningful way. You could certainly speed things up a bit with high priority, and slow them down with heavier compression. 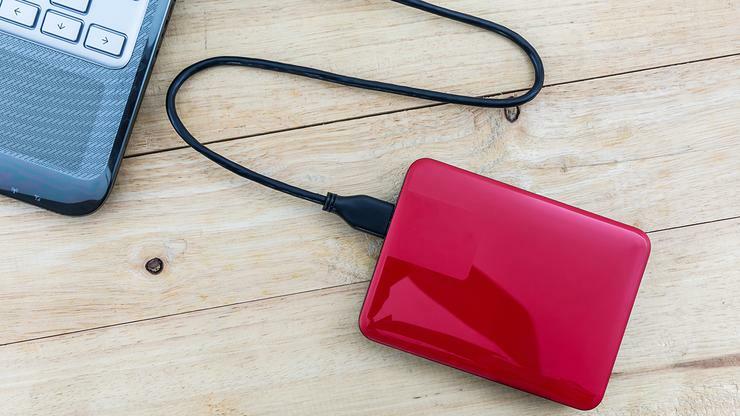 In my experience, heavier compression doesn't shrink the files enough to matter with today's super capacious hard drives and SSDs, making the the trade-off in performance not worthwhile. But that's on a per situation basis which is why, of course, there are the options. One thing that has always annoyed me are programs that don't support their own previous file formats. There are many. R-Drive Image was always good about this, but they did stop supporting an old file format about 10 years ago. But the company is thoughtful enough to provide a transition version to its customers that supports both the older and image formats. R-Drive Image has been a reliable standby of mine since the first time I reviewed it over a decade ago. I've of course tried and used others, but R-Drive has never failed me and on a number of occasions I've made R-Drive backups to back up the backups made with other programs--it's been that steady. It's also a hoot to use the character-based interface in front of users who aren't experienced with such things. I might wish for non-proprietary file formats, but if you want imaging that just works, this is it.